A little over four years ago, I wrote about some of the odder things I’d experienced with pregnancy, many of which I hadn’t seen in other “weird pregnant things” articles. Since I’m back where I was around that time (though about six weeks further along), I figured I’d do it again, especially as my body has been kind enough to try out some new things this time. Apparently, I bleed while pregnant, and it’s not really a thing of concern (for me, so far at least). It’s actually happened more in this second pregnancy, but I’ve remained pretty calm about it. Of course, any bleeding should be reported to your doctor or midwife, just to be sure. While it’s usually a very small amount, I bled noticeably more after a transvaginal ultrasound. Most likely, the probe bumped up against my cervix and irritated her. I am Rh negative (my red blood cells do not have a particular protein), which essentially means my body could develop antibodies to a baby who is Rh positive (as most people are, including my husband). I had the immunoglobulin shot that prevents this during my pregnancy with Iris (around 28 weeks), and it was planned for this time. I actually got the shot twice due to bleeding early on. Again, any bleeding, call your doctor, especially if you are Rh negative. I don’t remember this happening as much the first time. My sleep in the first trimester was horrible. Obviously, my sleep is less sound than before I had any kids. However, I found myself having wild, vivid dreams and being wide awake in the middle of the night with no prompting from the world external. First trimester sleep disturbances are common, but that doesn’t mean they’re easy. Something else I noticed while lying down… I was fortunate enough not to have “morning sickness” (beyond nausea when I let my stomach get too empty), but my mouth was definitely producing more fluid than usual during sleep and tooth brushing. Another common happening, but no more fun because of that. It’s common for women to experience more of these in a second pregnancy, and I kind of feel like it’s happening all the time. While Braxton Hicks contractions do not signal actual labor, they are uncomfortable and make me want to do absolutely nothing. They increase when I am more active, and make getting around tougher. At 35 plus weeks, I experience them several times every day, and have to stop and rest more often than I’d like. I’m not talking about bed rest or the need to sit from exhaustion. I mean I simply can’t move as much. With Iris, I easily continued Zumba until days before her birth. Despite being heavier and cautious, I could lift my legs and follow the quick dance steps. This time, it’s like my hips are stiffer and Just. Won’t. Go. I think it’s because this baby is significantly lower than Iris was, and it’s messing with the mobility of my entire core. I dealt with this last time, and it’s come back even stronger now. By the end of the day, the skin and muscle just below my rib cage, and only on the right side, is sore to the touch (and without it). Sometimes, it even wraps around so I can feel it in my back. 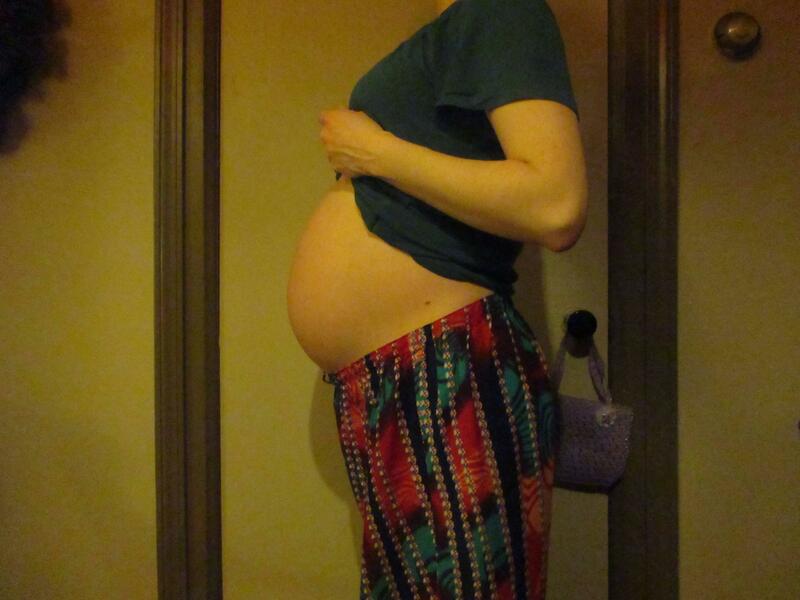 I’m also more tender farther down my abdomen, as this baby is lower and (feels, at least) bigger. While it’s nice when the OB tells me the discomfort is more common among mothers who are “in shape,” it’s exhausting when I just want to find a sleeping position that doesn’t hurt. With four weeks to go, I imagine I’ll encounter a few more weird things about pregnancy. As this is likely the last time I will be pregnant, I probably won’t know how much weirder it can get. I admit a little curiosity, but contentment in taking others’ word for it.